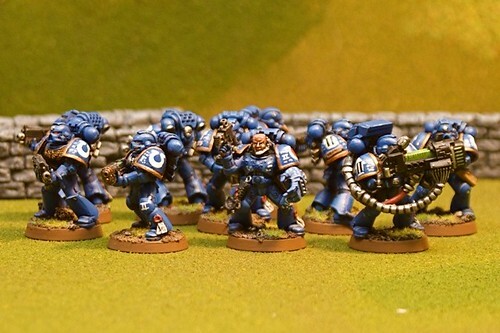 I hope you all enjoy this blog that will chronical the creation of my second company of Ultramarines. Before I go too much further, I'll give you a little big of background on my army. I've been playing Space Marines since the first time I saw 40K back in the days of second edition and Dark Melinium. Wow, that was such a long time ago. The only problem is that I never stayed with any Space Marine army for too long. It was orks off and on, a new chapter of marines, back to orks, and then a long time with Emperor's Children. Four years ago, I sold off the Emperor's Children and started this army. Yeah, its been taking me a long time. The end of 3rd edition, all of 4th edition, and now the early part of 5th edition. As a result, some of the squads presented may look a bit odd to tournament vets and meta-gamers. Not that I care much, since I rarely play these days. With the newest Space Marine codex, I decided to collect a full company. Since my partially completed army already consisted of the second company, it didn't take me long to get the rest of the army nailed down. 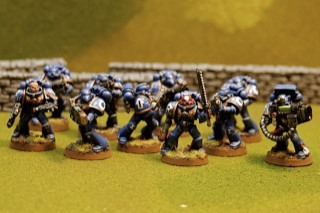 I asked a few questions on the Ultramarine forum about how to consider making up the company (follow the company in the codex, or do my own thing). For the most part, I decided to use the codex as a guideline while at the same time allowing for flexibility. The army will consist of 6 full tactical squads with Rhinos or drop pods, 2 assault squads, 2 devastator squads (no rhinos! 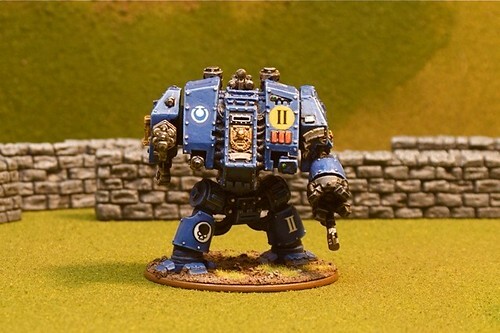 ), command squad, terminators with a landraider, speeders, at least one scout squad, predators, and dreadnoughts. I'll also include plenty of command and elite/special options and special characters. Like I said, I've been collecting these marines for neary five years- just without any cohesive plan! Clearly, I'll have a full company with plenty of auxillary troops. Currently, I own all of the needed models except a few assault marines. So there will be a few odd troop compositions- since the first tactical squad was completed almost 4 years ago. Several have had subtle changes to them, and all of the tactical squads have had a heavy weapon added with the new codex. Many of the squads will get an 11th/12th man to help increase their flexibility. Ok, so enough of the boring words... here are some pictures! Lots of plasma. Clearly a melding of the last three codex. The second of my tactical squads that have been completed for a few years (minus the newly added heavy weapon). This metal dreadnought has been in my collection for nearly 10 years and has been painted a number of times and then stripped. A few bits have been added here and there over the years. 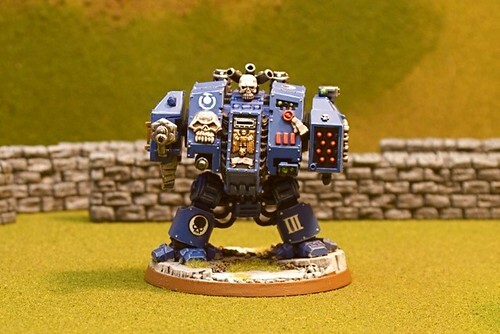 I *think* this was initially a dark angles dreadnought.